Type A, Class 1 saw protection in these waist trousers for occasional chainsaw users. With tough construction thanks to a polyester/cotton twill, these are durable trousers ideal for occasional chainsaw users. They feature a reinforced saw protection pad on the lower inside to help withstand wear and tear from boots. These are available in a choice of ten sizes, with Type A, Class 1 saw protection. 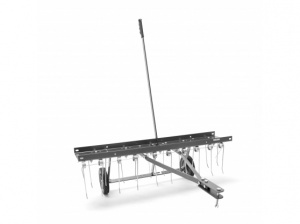 A dethatcher designed to be towed behind a lawn tractor, this simple tool is ideal for removing excess thatch from a lawn's surface, resulting in lush, green colour through regular use.